Cast: Leonardo DiCaprio, Cate Blanchett, John C Reilly, Kate Beckinsale, Alan Alda, Alec Baldwin, Jude Law, Ian Holm, Willem Dafoe, Brent Spiner, Gwen Stefani. Directed by Martin Scorsese, produced by Michael Mann. Story: The life of Howard Hughes. Running Time: 2hrs 50 minutes. From the sublime to the ridiculous. The last biopic I saw was Beyond the Sea, in which the fairly mundane episodes of the star's life were punctuated with musical numbers to fill the 2 hour quota. The Aviator, by contrast, keeps the story rattling along and yet still there is plenty to fill nearly three hours. Howard Hughes was certainly an interesting chap, if maybe a melon ball short of a fruit salad. 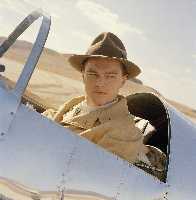 The Aviator follows the eccentric tycoon Howard Hughes (DiCaprio) through his film-making, personal relationships and ever-dwindling sanity, all the while centering on Hughes' primary driving force of making and flying aeroplanes. We learn about the advancement of the US aviation industry and the conflict between TWA - acquired by Hughes - and Pan Am, run by a seemy Alec Baldwin, in their battle for supremacy in the transatlantic marketplace. Hughes develops new planes, including the well-known Spruce Goose, and test pilots all of them himself, leading to the film's most spectacular crash sequence. The graphics used in this sequence work very well and the crash is very convincing, however the same care has not been taken elsewhere. The opening scenes involve the filming of Hell's Angels, featuring myriad period planes flitting hither and thither. The movement of these planes does not look real and jars somewhat, so that when the camera zooms straight into the cockpit, it is no surprise as it was already pretty obvious that the planes are just figments of an animator's imagination. Fortunately these scenes are finished with quickly and the only after-effect is a fleeting suspiciousness whenever another plane appears on screen. I've never been convinced by Leonardo DiCaprio as a powerful lead. Maybe it's his size, maybe it's the fact that he looks about twelve, maybe it's that his name sounds like it means "Lion who drives that car from The Professionals". Whatever it is, he's suited more to his role in Catch Me If You Can than in the guise of a movie mogul and history-making entrepeneur. Still, he does a credible job and my only complaint is that he still looks about twelve (git). The rest of the cast is a veritable Who's Who of supporting actors. The ever-reliable John C Reilly is Hughes' loyal PA, Cate Blanchett plays love interest number one Katharine Hepburn, Kate Beckinsale is love interest number two Ava Gardner, Jude Law oozes by as Errol Flynn a couple of times. Willem Dafoe, Ian Holm, Gwen Stefani (fruitcake singer from No Doubt) and Brent Spiner (Data from Star Trek TNG) pay small visits and Alan Alda gives a magnificently human performance as the bad senator on Pan Am's side. 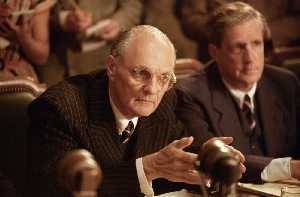 Speaking of which, the exchanges between Alan Alda and Leo during the final courtroom scenes are very cleverly done - the dialogue is perfect and is delivered by both parties with substance and aplomb. The Aviator is by all accounts a very accomplished piece of work. Looking back on it now, there are many memorable scenes and the story is one of triumph over adversity, of the importance of one man's vision. Everything works well together and it's hard to put a finger on why it is that I'm only giving it 3. It is everything I said it was - to mark it on merit I would give it a 5 - but I just didn't enjoy it that much. Maybe three hours is just too long for my little brain to cope with. Testosterone Satisfaction Rating: 1/5 The airborne scenes are quite testosteroney, but we don't need to see Leo's arse. Really.